Brisbane Duo / Band 458 – This band prides itself on attention to detail, diversity, reliability, flexibility and providing a high energy, memorable performance every time. 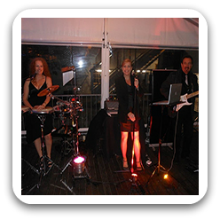 This band covers every corner of the classic hits songbook along with current day pop favourites ensuring your corporate, private function, wedding or special event is a success. Performing genres such as Jazz, Easy Listening, Dinner and Dance, you are guaranteed a night to remember. Global musical experience coupled with first class performers form this vibrant, popular band and its ensembles. Our resident DJ can be added to any of the lineups. She will integrate with the overall performance, seamlessly blending into the repertoire enhancing your entertainment experience. Duo features: Lead Guitar and Lead Vocals. Trio features: Lead Guitar, Lead Vocals with Percussion and backing vocals. 4 Piece Band features: Lead Guitar, Lead Vocals, Percussion and either Rhythm Guitar or Keyboard with backing vocals. 5 Piece Band features: Lead Guitar, Lead Vocals, Percussion, Rhythm Guitar and Keyboard with backing vocals. 6 Piece Band features: Lead Guitar, Lead Vocals, Percussion, Rhythm Guitar, Keyboard and Drums with backing vocals. 7 Piece Band features: Lead Guitar, Lead Vocals, Percussion, Rhythm Guitar, Keyboard, Drums and Bass Guitar with backing vocals. 8 Piece Band features: Lead Guitar, Lead Vocals, Percussion, Rhythm Guitar, Keyboard, Drums, Bass Guitar and Saxaphone with backing vocals. For your special event we are able to perform to your specifications whether it be smooth jazz or dinner music to start, progressing into dance music later in the evening or purely dance music for the whole event, we are guided by your requirements and guests. Production including Full PA and lighting is supplied for events up to 200 people. For larger events over 200 people additional professional production is available including staging, lighting and sound with engineer on site. All members of this band are covered with current public liability insurance. 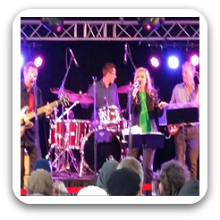 Can perform as a: Duo to 8 Piece Band and are available to perform in Brisbane, Gold Coast, Sunshine Coast and Surrounding Areas. These guys were awesome! Consummate professionals, they set up and took down after with a minimum of fuss…but most importantly, the music was brilliant! Great dinner sounds then after they had us up dancing and having a blast! Highly recommended. My Husband and I would like to thank such great people for a an amazing night; the music was wonderful and they had everyone up dancing all night. would love their CD and would highly recommend them, wish them all the best . professionalism and warmth. You were both a hit. party guests are spreading the word as well. Thanks again everyone. I had a great birthday night. We have used this Trio for our Christmas party 3 years in a row and every year the staff request them. They look and sound fantastic! The music they play is so diverse, their range is superb and the way they deliver it is second to none. They are so vibrant on stage and make sure everyone has a great night. I would highly recommend this band to anyone wanting a memorable function. They are always a pleasure to deal with. They brought in the New Year for us on the Gold Coast, it was our pleasure to see such a talented Guitarist and Vocalist .The Dance floor was crowded the whole night and they played a fantastic range of music that kept the everyone asking for more. Thank You Thank You! What a fantastic band and so perfect for our function. From the minute we spoke about what we needed and wanted for the guests, every request was met. If you want your guests dancing all night then this band is for you. Highly professional, reliable, approachable and accommodating. World class guitarist who blew us away and three fantastic musicians and vocalists. Cannot recommend these guys enough! With my friends we recently had these fine Artists and they had the audience applauding and asking for more, we are looking forward to seeing these Guys perform soon. This duo have entertained us on several occasions, and I must say, ” it doesn’t get any better” I have a great appreciation of “good” music and talented artists and these highly talented and professional artist have my vote! I had the best new years eve in 2016 dancing to an avalanche of wonderful memories and songs, well done! We had the privilege of having the 5 piece band perform for our work convention and they were superb. We all travelled by charter boat to the island and whilst on board their DJ mixed and played all our favourite tracks to suit the crowd. She even performed on our boat trip home which made the atmosphere like a nightclub. I would strongly recommend this band as they sounded amazing, took requests, were so flexible and got us all up dancing. Our 100 strong crowd were in for a party and they delivered. Simply Awesome! We used the duo for a staff conference (45 people) and they were brilliant. Vocals sensational and best guitarist I have ever heard in a local band. Would recommend to anyone. This was our 10th conference and this is the best band to date. A very impressive duo who read our guests perfectly and delivered professional and uplifting music for our fundraiser.